I got Reinhart's book for Christmas about 5 years ago and I've been dying to try eggs on pizza ever since. 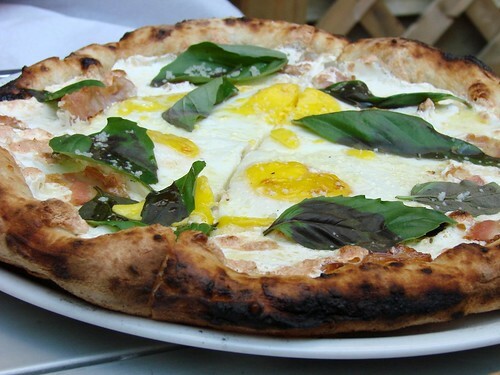 I had my first opportunity at Paulie Gee's pizza tasting at the end of July and then the next weekend Lawman and I made the trek out to Williamsburg for a brunch of Pizza al' Uovo at Motorino. Now I recognize that there are differences in the ovens--Paulie was cooking with a smaller home pizza oven and Motorino's is larger and hotter. And I'll admit that I've only had the pie once from each, but when it comes down to taste, this round goes to Paulie Gee's home brick oven. 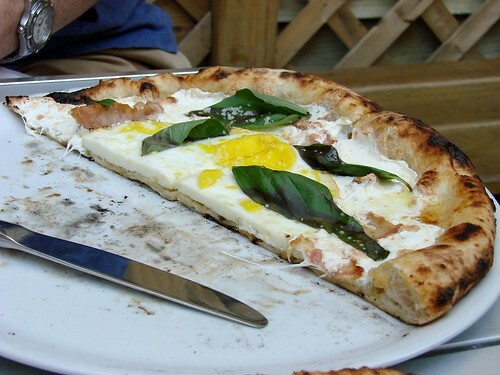 Paulie Gee's pie was a Bianco with speck, Parmegiano Reggiano, and sunnyside up eggs topped with basil. One of my irrational food aversions is fully cooked egg yolks. I'll abide by them in egg salad, but otherwise no thanks. My mother-in-law on the other hand, won't touch an egg yolk until it's completely and totally cooked through. To each his own, I suppose. There's no denying that I love Motorino's excellent Neapolitan style pies. In fact, I think they make some of the very BEST Neapolitan pizzas in the city. And reading through Carey Jones' Ortine vs. Motorino's Breakfast Head to Head, perhaps I just got Motorino's Pizza al Uovo on an off day. Or perhaps you need to specify that you want the eggs runny? The brunch at Motorino was $10 and included fresh squeezed OJ and coffee, which is a pretty good deal for brunch in the city and more than filling. 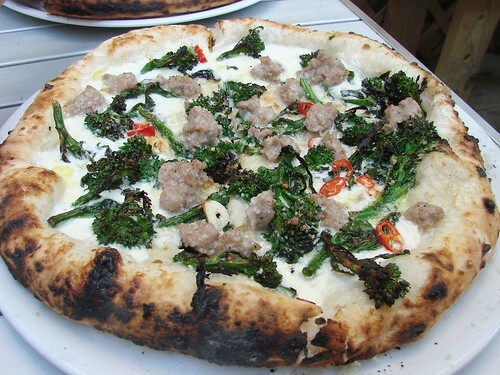 Even though we weren't overwhelmed by the Pizza al' Uovo, the Pugliese pizza we got with burrata, broccolini, sausage, fresh chilies and garlic was excellent. The chilies gave the pizza just the right amount of heat and um, you just can't go wrong with sausage on a pizza. Another bonus...no wait for a table at Motorino for brunch at 3:00pm. I love the idea of eggs on a pizza. I've had so many other good pizzas from Motorinos, I'd be willing give their Pizza al Uovo another shot. In the meantime I'll send good pizza vibes out to Pizza Master Gee that he'll be opening his own place soon. *While Paulie Gee himself, might have complained that the yolks were overcooked they were 1) overall runnier than Motorino's and 2) the yolk on my slice--the solo slice in the picture above--was runny perfection. 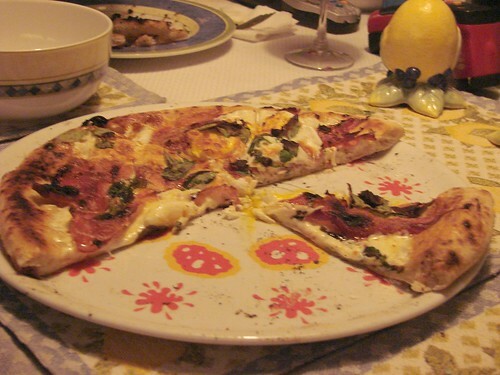 As Pizzablogger so aptly put it the yolk added "a sinful richness of flavor and density of texture to the pizza. Egg yolks go VERY well with crust and it was here I really appreciated the chewiness of Paulie’s end crust, which has a thin outer snap-crisp to it and is definitely imbued with a subtle smokiness. Another damned good pizza, which would have ruled with a proper Bloody Mary alongside of it!" Well said, Pizzablogger. Well, said. You are making me blush Brownie. Thank you very much. Brownie, it's a shame your Motorino pizza al' uovo didn't turn out well! I'm with you on runny yolks—hard-cooked, no thanks—but the three or four times I've been there, they came out perfectly soft. It definitely made the pizza. I'd encourage you to give it another chance... when Paulie Gee's not cooking for you, of course! Perhaps you need to give it another try. Hey! Here in Australia everyone does eggs on pizza - all the pizza shops call it 'The Aussie' pizza. So bloody good! I love reading about your NYC adventures and can't wait to go back and try some of the places! First stop: The Shake Shack for a frozen custard. You can grab the opportunity of Buy One Get One Pizza Free at Bellacino's Pizza and Grinder.